I am a week behind so it is time to catch up. 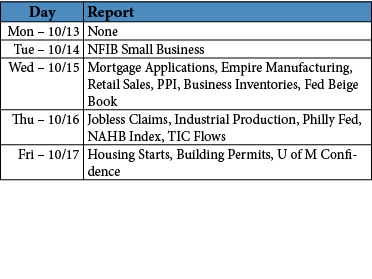 Economic reports were sparse last week so much of the discussion there will be focused on the week prior. Financial markets will be covered for both periods. 1. Nonfarm Payrolls: 248K vs. 215K est. We got the report we needed to see after August’s disappointing print of 142K (subsequently revised to 180K). 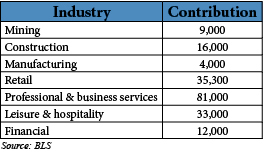 Payroll growth was strong in several areas of the economy as seen below in Figure 1. Continued hiring in construction, retail, leisure, and financial all bode well for the economy going forward. The labor participation rate fell slightly to 62.7%, a level last seen in December 1977. Part of the decline came from 97K people leaving the work force, but it is more important to focus on the job growth currently occurring. Over the last year, the U.S. economy has added ~220K jobs a month. The 6m moving average is back to decade high in 2006 which marked the top of job expansion before the economy tipped over into recession. The combo punch of a smaller work force and job growth has pushed the unemployment rate below 6%. On top of all the job additions, we are seeing earnings and hours move up. The Fed is keeping close tabs on the labor market because as labor slack dissipates, wage inflation is the next concern. As it tends to be a lagging indicator, the Fed could overshoot its stated 2% target without realizing. 2. ISM Manufacturing: 56.6 vs. 58.5 est. Manufacturing took a small step back but remains at a comfortable level for further expansion. Nearly all categories experienced a slower rate of growth other than prices and production (barely) which increased at a faster rate than the previous month. For now, it is a one month drop from a sharp run up in the summer. Keeping ISM around a 54-57 level over the next quarter will give us solid footing for 2015. 3. Personal Spending: 0.5% vs. 0.4% est. Positive news from the consumer side with the latest spending and income reports. After initially printing negative, July’s spending numbers were revised to unchanged while income saw a 0.10% boost as well. August beat expectations of a 0.4% increase and matches up with the 0.6% increase in retail sales for the month (September retail sales will be released later this week). With the disparity between spending (0.5%) and income (0.3%), the national savings rate moved down to 5.4%. Consumers look a little stretched when you compare against historical numbers, but I need to do further analysis to determine the factors. 4. Case/Shiller 20 City Composite (YoY): 6.75% vs. 7.40% est. On a headline basis, the readings from this report look bad over recent months. However, we need to view them in the proper context. After coming out of the bottom, home prices increased solidly and we are now reaching the point of stability. Prices are increasing month-to-month still. The YoY growth is slowing though as the market returns to a more normal state. In a vacuum, we are up nearly 7% from last year! I’ll take it. Stocks ran into more pressure two weeks ago as October kicked off. Spoos (S&P 500 futures) dipped below 1920 for the first time since mid-August as global growth concerns and domestic reports provided reason. German and U.S. manufacturing data disappointed on the 1st, but a better than estimated NFP report on the 3rd brought buyers back into the game to give major equity indices a breather. Small company stocks have had a tough year so far and last week was no different. The Russell 2000 Index touched the -10% from year highs level during the week. There were certainly plenty of things swirling around the headlines to cause a stock shakeup: rates, China, the ECB, ISIS, Ebola, and Russia. The story continued throughout last week. To understand the mindset, one need look no further than the report from the IMF which included statements about “frothy valuations” and a cut of its global growth forecast. There is a mounting level of concern about Europe, especially with negative reports about Germany’s manufacturing industry and economic strength as a whole. The strong USD move over the last two months has also heightened the level of worry (stronger dollar means more expensive imports for foreign customers). On the silver lining side, weaker currencies abroad mean U.S. consumers will be able to import goods for cheaper. Domestic growth is looking optimistic so the net result could be more muted than some are expecting. Cheaper raw materials are not the worst thing (crude falling to lows last reached in late 2012). Commodities are facing a strong dollar and weaker demand so the picture there looks fairly miserable from a short term trading view. I think we can expect a rotation out of multinational corporations in the coming months as investors focus on domestic exposure. Treasuries saw aggressive buying as stocks were hit. We are approaching 2.25% on the 10 Yr which is far below where many expected us to be at the start of the year. Last year the story was a 100bps climb in yields, this year it might be a 100bps decline. As central banks overseas cut rates, there will only be further demand for U.S. bonds and the dollar. Certain parts of the equity complex got mashed, notably, tech stocks received punishment after Micron Technology (NYSE: MU) issued a statement about a slowdown in the semi space. Volatility rocketed higher over the course of the week with the CBOE VIX Index moving above 22 to end the week. The long-term average for the VIX since 1990 is around 20. I think we forget sometimes volatility does exist, especially after summers like the one we just had (VIX averaged roughly 12.5 from June to August). Volatility is healthy for markets as long as it does not reach extreme levels. Investors with time horizons beyond next week should focus on the bigger picture. Stocks tend to go up. Domestic fundamentals are strong. An economy with a 2-4% GDP is supportive of buying risk assets. Since 1990, the S&P 500 returned 2.67%* on average in the quarter following a positive GDP reading. Data is relatively light this week with the most important releases being retail sales, industrial production, and housing starts. The volatility within housing starts has widened out in recent months, but this week’s number will be important in showing whether the upward trend remains. The same goes for industrial production which tipped over in August. I am not expecting a pretty flower for the week. The way we closed on Friday did not point towards a weak of unicorns, rainbows, and pots of gold. Taking off my econ hat for a minute and putting on my chartist vest, the technical signs look like we are poised to test certain support levels. The cries for a 10% correction get louder each day. We would need to breach the 1817 level on the S&P to hit that mark based on closing prices for the Index. Support levels on the way down are 1900 (broken), 1850-1860, 1815 (April low), and 1750 (Feb low). Small and mid caps are negative on the year. The Dow Jones is flirting with the flat line. The NASDAQ and S&P 500 are a few percentage points above zero, but could cruise below in the coming weeks. All-in-all, I personally think this environment is going to be rather short lived and will set the market up for the next move forward. If Europe’s growth issues do not blow out and domestic growth keeps chugging along, there are fundamental reasons to own equities.